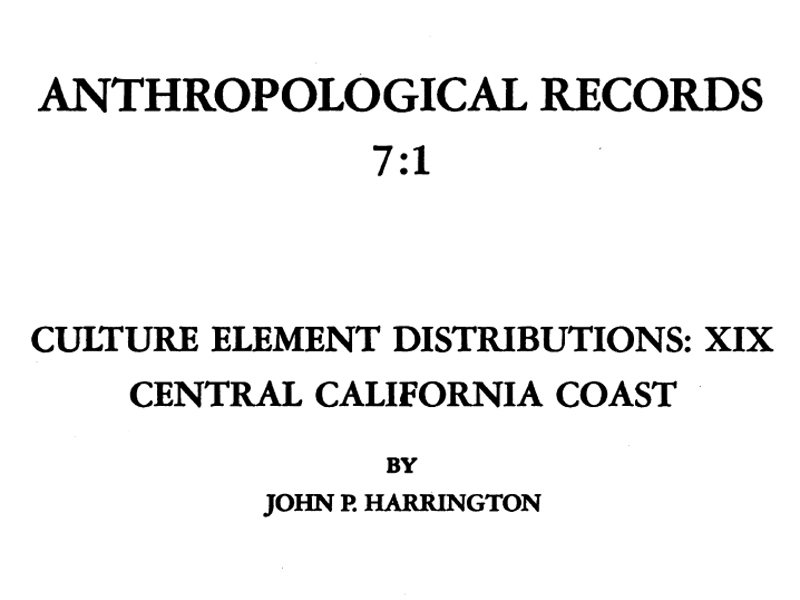 SCVHistory.com | Native Cultures | Local Ethnobotany: TEA21 Rural Roadside Inventory, Caltrans District 7 (Fortier 2008). Local Ethnobotany: TEA21 Rural Roadside Inventory. Caltrans District 7, County of Los Angeles. Prepared by Jana Fortier, Ph.D. The objective of this survey has been to develop a cultural resources management strategy for the area in consultation with Native American elders. The specific goal of the survey has been to identify areas where plants used for basketmaking and other traditional activities are growing. Together, the overall survey objective has been to enable Caltrans crews working in the District 7 project area to have the cultural and botanical information necessary to manage the areas in a manner that facilitates communication with Native American plant collectors. The Transportation Equity Act for the 21st Century (TEA-21) was enacted in 1998 authorizing Federal programs for highways and transit programs. Among other requirements, TEA-21 has demanded that highway plans protect and enhance the environment and also promote efficient operation of the transportation system. In fulfilling the mandates of the program, another key component has involved The National Scenic Byways Program, which designates roads with outstanding scenic, historic, cultural, natural, recreational, and archaeological qualities as All- American Roads (AAR) or National Scenic Byways (NSB) (USDOT 2008). This report is written in order to fulfill the overall requirements of the TEA-21 mandates and specifically to provide an ethnographic consulting report for the D-07 TEA Archaeological Roadside Inventory Project. This report is one of two ethnographic reports written for the D-07 region comprising both Los Angeles County and Ventura County. This report specifically concerns ethnographic findings in the Los Angeles county portion of the D-07 region. The indigenous peoples of Los Angeles maintain a lasting connection to the land. This enduring connection partly is created through indigenous knowledge of culturally significant plants and animals. This report describes the results of ethnographic interviews with Native American elders and plant surveys along designated District 7 highways. The surveys were intended to elicit information concerning culturally significant plant gathering sites and other sites with contemporary cultural significance to Native Americans who are indigenous to the Caltrans D7 Los Angeles County project area. The project area consists of highway corridors along 1) Pacific Coast Highway (SR- 001); 2) Angeles Crest Highway (SR-002); 3) Golden State Freeway (I-5); 4) Antelope Valley Freeway (SR-014); 5) State Route 18 (SR-018); 6) Moorpark Freeway (SR-023); 7) Topanga Canyon Boulevard (SR-027); 8) Azusa Avenue (SR-039); 9) State Route 101 (SR-101); 10) Ronald Reagan Freeway (SR-118); 11) Korean War Veteran's Memorial Highway (SR-126); and 12) Pear Blossom Highway (SR-138). The project roads consist of approximately 400 miles of roadway (See Map 1). Along the corridors on both sides of the highways, the roads were surveyed for culturally significant plants and other Native American traditional cultural properties visible above ground, extending approximately fifty feet from the highway right-of-way. The survey team identified a total of 106 species of culturally significant plants growing along the project roadways. The locations of the gathering sites are reported to Caltrans in this report along with recommendations for managing the areas in a manner supportive of traditional gathering activities.